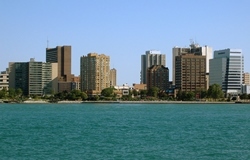 City in Brief: This border city is located in Southwestern Ontario on the Detroit River, directly across from the U.S. city of Detroit. It is Canada’s southernmost city and has a long history as one of Canada’s major auto manufacturing centres. Manufacturing remains a key part of the city’s economy, along with tourism due to the city being home to one of the largest casinos in the country – Caesars Windsor.